The recent streak of warm weather here in Atlanta (literally a week after a dusting of snow -- we have such odd weather here) does nothing but remind me that shorts, tank top and bikini season is rapidly approaching. We have started taking a closer look at some of the things on our weekly menus, and are trying to consciously swap out higher-fat meals for things that will give us high energy while remaining low-calorie and low-WW Points. Don't get me wrong; the frozen Italian meals-in-a-bag are still in the freezer (there are always great coupons for those, and they are easy to throw together on a late-night weeknight) and Chin Chin and Piu Bello will still get calls every other week or so. But I really feel my best when I load up my plates with fresh vegetables and lean meats, so why not proactively design our menus around that? To kick it all off right, our Sunday trip to Publix involved more time than usual in the Produce section, because we had three recipes in mind for the week ahead. I am so excited to share two of them with you here. If you have ever even remotely considered doing something like the Mediterranean Diet, these two recipes are definite winners in our books. 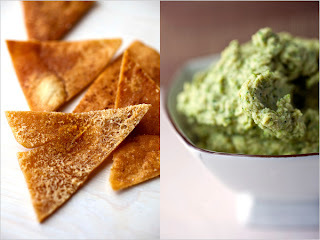 Broccoli Chickpea Puree -- What is termed by it's New York Times author as "green hummus," this mixture comes out tasting nothing like broccoli, but is chock full of broccoli's nutrients anyway. We (ok not me, I just watched haha) whipped this tasty recipe up in under 10 minutes, and it makes a ton! I smothered mine on whole-wheat pita bread, or you can also use it as a spread for a sandwich -- turkey, sprouts and tomato might be great. They also recommend putting it on crostini, serving it up warm. Tabouli -- I have termed this the best tabouli (tabbouleh? tabouleh? Why do they insist on spelling it differently everywhere?) that I have ever had, much to the pleasure of the chef (again, I didn't actually DO much of this cooking this weekend. I played "sous chef" and helped with prep and mindless chatter instead, hehe). This version of the traditional Middle Eastern salad is fresh with lemon juice, mint, parsley and salt, and the cracked wheat (we used whole wheat couscous) makes it a filling dish without being heavy. I kid you not, I can't wait to have this as part of my lunch today, it is that good. Our tip: Make both of these and use together on a warm pita. Oh. My. Goodness. Can I book my trip to Greece now, please?